WIDOW OF THOMAS GREGORY ESQ. Caroline Cooper was born in Sunninghill, Berkshire in c.1814. At the time of the 1841 census she was living at Warfield, Berkshire with her parents Joseph & Mary Ann Cooper and her older brother Charles and younger sister Ann. At the time of the 1841 census at the age of 48 Thomas was still living with his parents and his younger sister Mary and a lady called Hannah Clark, all of whom were described as independent. Four male servants also lived with them, and these probably worked the farm. On 29 July 1841 at Wolvercote church, Thomas’s sister Mary Gregory married Lawrence Eborall Judge, who was the perpetual curate of Wolvercote from 1837 until his death on 16 September 1853 and also chaplain of New College and Merton College, Oxford. Following the death of his father at Cutteslowe at the age of 74 on 1 December 1841, Thomas took over the farm. Mary Elizabeth Caroline Gregory (born at Cutteslowe Farm, Oxfordshire on 23 February 1844 and baptised at Wolvercote Church on 1 March). At the time of the 1851 census Caroline (37) was living at Cutteslowe Farm with her husband Thomas (58), who was described as a landed proprietor employing twelve men and three boys, and their daughter Mary (7). Four servants were living with them: a cook, housemaid, groom, and carter. Caroline’s husband Thomas Gregory died at Cutteslowe Farm on 11 June 1853, but neither he nor his father was buried at Wolvercote Church. His death was announced in the Morning Chronicle. By the time of the 1861 census Caroline (47) and her daughter Mary (17), who was still at school, were living in Oxford at North Parade with Caroline’s widowed sister-in-law Mary Judge (65). On 17 February 1870 at Ss Philip & James’s Church Caroline’s only daughter Mary Elizabeth Caroline Gregory married Thomas Henry Gregory, a clergyman of York. Thomas Henry Gregory was born at Mount Villa, Dringhouses, York on 7 March 1842 and baptised at St Mary Bishophill, York on 2 April. He was the son of Thomas Gregory and his wife Mary. At the time of the 1851 census Thomas (9) was living at Mount Villa, Dringhouses with his father Thomas (65), who was an importer and dealer in tea; his mother Mary (47); and his sister Mary Emily (21), plus their four servants. They were still there at the time of the 1861 census. Thomas’s father had now retired and was serving as a magistrate of the City of York, and as well as his sister Mary another sister, Janson Alice Gregory (26), was home with them. They still had four servants. Thomas (19) was described as a scholar, and shortly afterwards on 23 May 1861 he was matriculated at the University of Oxford from Brasenose College. He obtained his BA in 1865 and his MA in 1870. At the time of the 1871 census Mrs Mary Gregory (27) was living in Cheltenham at 16 Montpellier Terrace with her new husband Thomas (29), who was then the Curate of Ss Philip & James’s Church in Leckhampton. Mary’s mother Caroline Gregory (57) was living with them, and they had two servants. † Mrs Caroline Gregory née Cooper died at North Parade at the age of 59 on 1 May 1874 and was buried at St Sepulchre’s Cemetery on 7 May (burial recorded in the parish register of St Giles’s Church). Grace Tertia Gregory (born in Padbury, Buckinghamshire near the beginning of 1881 and baptised there on 13 March). The family moved from Cheltenham to Padbury in Buckinghamshire when Thomas was appointed Vicar there in 1876. At the time of the 1881 census Thomas and Mary are hard to find, but heir children Lucy (6), Mary (4), and Grace (two months) were at home in Padbury vicarage being looked after by a nurse, cook, and a housemaid. In 1891 Thomas (49) and Mary (47) were at home at Padbury vicarage with their daughters Lucy (16), Mary (14), and Grace (10), plus a cook and a housemaid. On 19 December 1894 in the Buckingham registration district (probably at Padbury church), Lucy Caroline Gregory married the solicitor John Stanwell Birkett. In 1895 Thomas Henry Gregory was appointed Vicar of Whalley near Clitheroe in Yorkshire. At the time of the 1901 census Thomas (59) and Mary (57) were at home in the vicarage at Whalley with their youngest daughter Grace (20) and one servant. Their other unmarried daughter Mary (24) was paying a visit to the family of a restaurant manager in Southport. 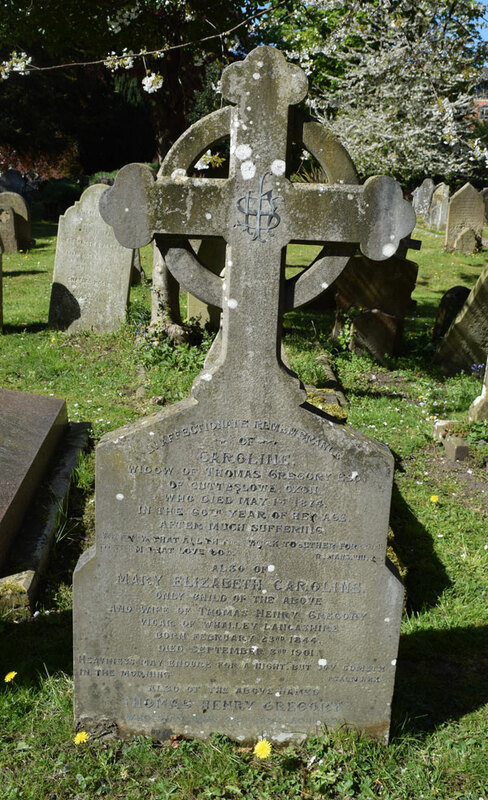 † Mrs Mary Elizabeth Caroline Gregory née Gregory died at the Vicarage in Whalley at the age of 57 on 3 September 1901 and was buried at St Sepulchre’s Cemetery on 6 September (burial recorded in the parish register of St Giles’s Church). Her sister Mrs Lucy Caroline Birkett was granted letters of administration. † Thomas Henry Gregory died at 9 Pembridge Place, Kensington at the age of 62 on 26 June 1904 and was buried at St Sepulchre’s Cemetery on 29 June (burial recorded in the parish register of St Giles’s Church). His effects came to £340, and his executor was his eldest daughter Mrs Lucy Caroline Birkett. In 1918 Thomas Henry Gregory’s three granddaughters sold Cutteslowe Farm to the Soden family. They in turn sold part of it to Oxford City Council in 1931 for a new council estate, and the remaining part, which is now Cutteslowe Park, to the council in 1936. Lucy Caroline Gregory, Mrs Birkett (born 1875) and her husband John had four daughters: Dorothy Ismay Birkett (1898), Marjorie Barnes Birkett (1899), Betty Constance Kay Birkett (1906), and Frances Mary Birkett (1911). At the time of the 1901 census Lucy (26) was living at 9 Pembridge Place, Kensington with her solicitor husband John (34), their first two daughters, and five servants (a cook, housemaid, and parlourmaid, and two nurses). In 1911 Lucy was living at 36 Lansdown Road, Holland Park with John (44), their four daughters, and five servants. It is hard to find her death. Mary Constance Gregory (born in 1877) married the Revd Thomas Kensit Norman in Paddington in 1905: he had succeeded her father as Vicar of Padbury. At the time of the 1911 census Mary (34) and Thomas (48) were living at Bradfield Rectory, Manningtree, Essex with their children Phyllis Mary Norman (3) and Thomas Gregory Kensit Norman (1), plus four servants. Their youngest child Patricia Janet Norman was born in Tendring in 1913. Mary’s husband died in Upton-on-Severn, Worcestershire in 1937, and she herself died there in 1939 at the age of 62. Grace Tertia Gregory (born 1881) was aged 30 at the time of the 1911 census and visiting Mrs Lucia Higgs at Fletcher’s House, Woodstock. She is hard to find after that date.